He was totally sure there was something different about the shape of the hedge. It was not like that when he saw it yesterday. 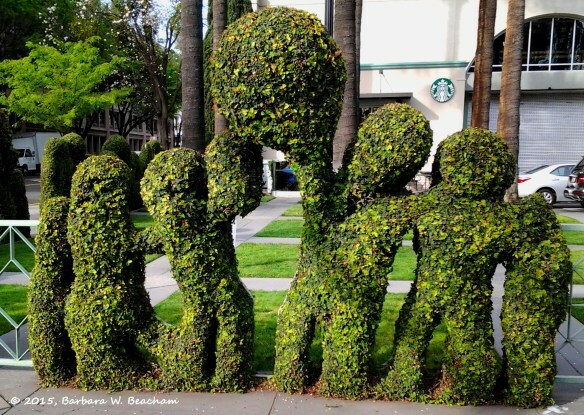 Of course, the hedges had been always shaped like people, or a family. But once again, there was something different. He stood there scratching his chin as his cerulean eyes filled with curiosity. “Oh!” said the barista, a bit shocked. “Yes, this is beautiful.” He could hear his awkward voice. The old man smiled. Then the barista said he need to go to work and left him. “You put yourselves in danger, children,” the oldman sighed. “You don’t know how tedious to stand at the same position,” answered the hedge. Capable of talking and moving. Loved it! Finally you made it! 😀 or .. it wasn’t your very first fiction in English? hohoho. I love the ending. Apparently that was a horror story too. Is it still available for this week? Yep, it just started yesterday and will be available until the next Monday. Anyway, do you know any indonesia writing prompt on blogspot/wp? Very well stated, I have the same issue with standing for too long….. I think those bushes better be careful or else they will be found out. Thank you for reading, Sally. How funny – a talking hedge. LOL! Good twist! Thank you! It’s truly fun to imagine such things capable of talking. See you next week? I hope so! Very nicely done… I love the ending! Whoa. It must be ‘interesting’ Thank you anyway!